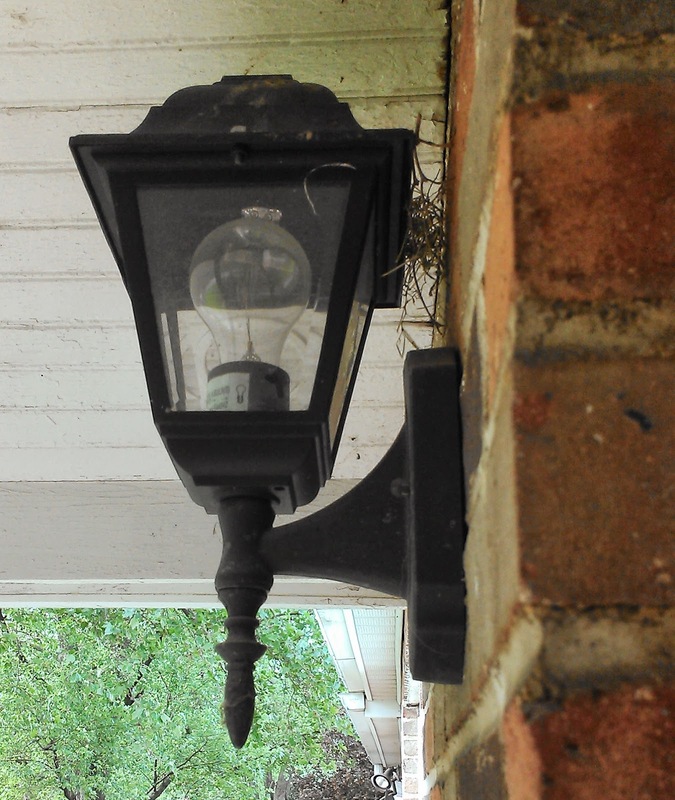 So every year about this time we notice a high level of bird activity on our front porch. I'm not sure what kind of bird it is (for accurate identification purposes we'll just call it a brown bird), but it likes to nest on one of the lights. Prime real estate for birds. 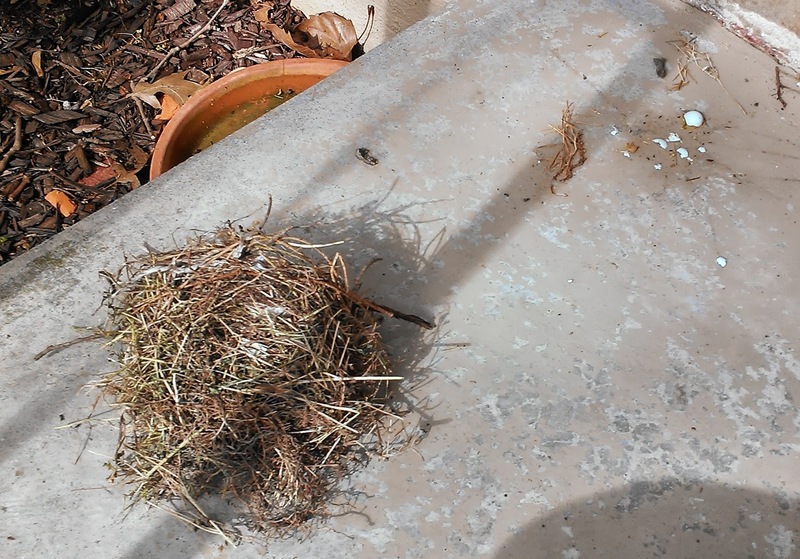 We try to discourage this nesting behavior because it usually results in small mountains of bird droppings right outside our front door and on more than one occasion we've had to dispose of the remains of brown bird progeny that fell from the nest before their wings were in working order. Last year, after the babies had cleared out, we removed the nest in hopes that they'd take the hint that we're not looking for tenants. And anyway, from a bird's perspective I just can't imagine that life on our front porch is all that tranquil and kid-friendly. I mean, would you really want to raise a family where a 40-pound beagle mix barrels toward your home barking with the menace of a cantankerous old man waving a shotgun any time another canine walks within 200 miles of the perimeter of our house? Your kids are gonna end up messed up living under those conditions. But the brown bird seemed unfazed by the dog and his ceaseless lawn surveillance. And sure enough she returned this year. Each time we'd open the front door we'd hear squawking and wings flapping as the disgruntled fowl scrambles to the nearest tree away from our offending noises and prying eyes. One day I noticed a few tell-tale strands of grass and other landscaping debris balanced carefully on the light and within a day or two there was a full nest. Sadly, in the end, the nest was not best. The other day I found the nest lying on the porch. A single, tiny egg cracked on the concrete. The crime scene. Well. We don't know that any crime was committed. Maybe it was just a wind scene. Either way the little whitish pieces at the top right is the broken egg. As much as I disagreed with the brown bird's choice of real estate, I was sad the nest fell. And I know I'm anthropomophizing here (but hey, that's what we human's do! 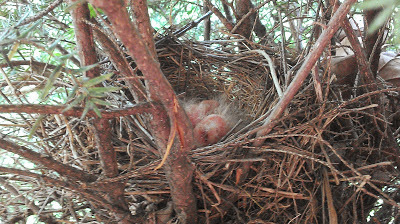 We're a self-centered lot) but I felt so sad for that mama bird. Here she'd put all this work into selecting a dry location for her home and then finding the choiciest bits of grass, twigs, string, paper towels, and what appeared to be part of a feminine hygiene product (OK, maybe she wasn't discerning enough) to construct a cozy spot to lay her eggs and just like that it comes crashing down. If she'd seen any news reports about those tornado victims down in Oklahoma I'm sure she would shake her head sadly and say "I know just how they feel." This life is such a messy business. But I don't want to end with cracked eggs and tornadoes. A month or so ago I noticed a robin swooping in and out of a bush next to my garage -- her mouth full of nesting material. I've been peeking in the bush every couple of days since -- one day finding one tiny blue egg. I picked up Lily to show her. "See honey, that's a robin's egg. Pretty soon a little bird will hatch out of it." -- but they are, in fact, baby robins. So on one side of my driveway an avian tragedy and on the other side an avian miracle. This life is a messy business. But it's also sweet, too.